As a Musculoskeletal Physiotherapist I often use tape as an adjunct to treatment to facilitate and encourage correct movement patterns with my patients. 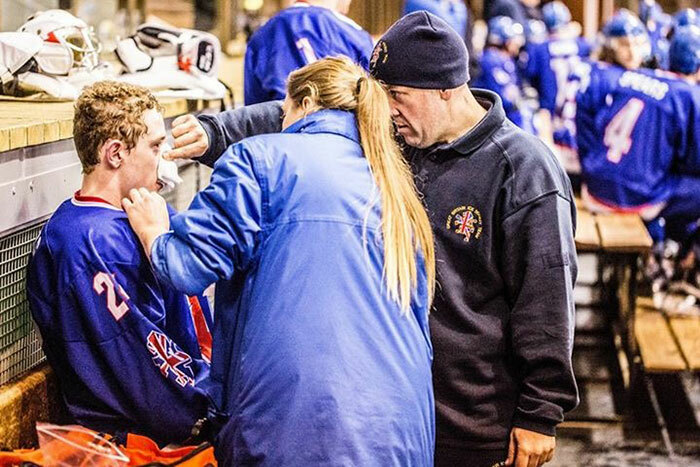 I joined the Great Britain Ice Hockey Team in early 2015 as physio for the U18s squad having never seen an Ice Hockey game in my life! My initial thought (aside from how brutal the sport can be!!) is how much potential there is for injury. At World Championship level the athletes will play 5 games, in addition to daily practices over a week long period, thus leaving little time for recovery and rehabilitation. Previously, although qualified as a â€˜RockDocâ€™, I tended to lean towards the more traditional, rigid Zinc Oxide taping methods. Watching the GB squad perform, it occurred to me how restrictive and (letâ€™s be honest) ineffective these techniques can be. Although the players usually spend no longer than a minute on the ice at a time, the intensity is phenomenal. I was finding the zinc oxide tape was lasting no more than 20 minutes and I often had to re-tape between periods. Not only does this take time away from the boys rehydrating and resting, but was also leaving them with uncomfortable skin rashes due to the lack of breathability. This year I joined the U20s squad for their World Championships in Megeve. Having a little more time to prepare, it occurred to me that it would be a great idea to approach RockTape to see if they would like to team up with Team GB for the competition â€“ to our delight they agreed! 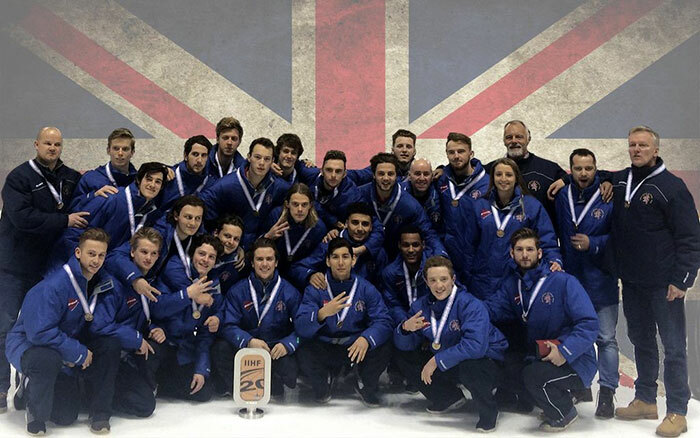 Having won the gold medal in the previous year, GB U20s were promoted to Division 1B for this World Championship. Coming in to the competition very much the underdogs, our aim was to simply stay in the division! A late withdrawal from Japan saw the International Ice Hockey Federation come to the conclusion that no one would be relegated from this yearâ€™s championship – very much relieving the pressure from Great Britain. We had carried a couple of recovering injuries through from club level but luckily nothing too serious. 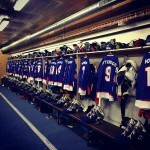 The first challenge for GB came in the form of Slovenia â€“ the team who had been relegated from the division above the previous year. After a 60 minute battle, GB reigned victorious, causing a massive upset to competition! 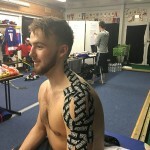 GB forward Macaulay Heywood had taken a heavy landing during the game but was quickly patched up with RockTape to promote the fluid effect and reduce the impact of the injury for the next match. Day two saw GB take on Poland. Having not skated the day before, Poland came out hard and fast, proving too much for GB. An unfortunate loss, but luckily no more injuries. 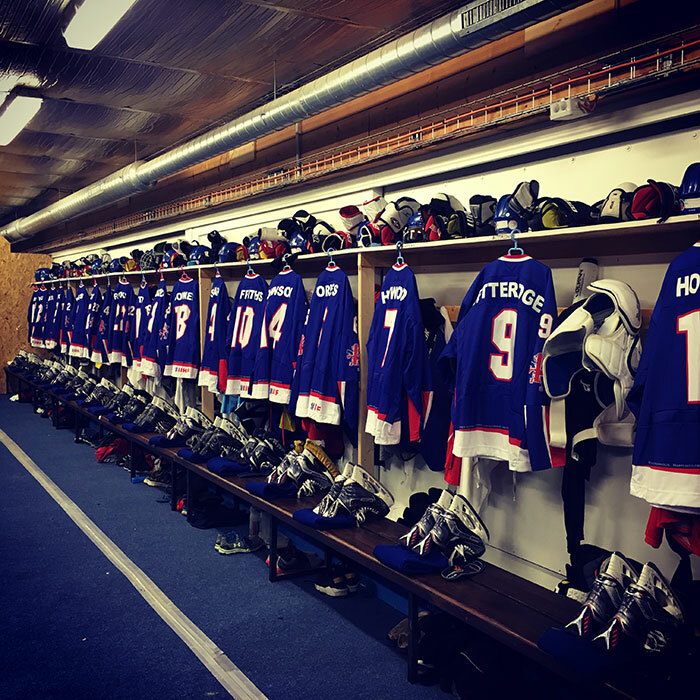 Great Britain were set to face France in the third game of the tournament. Having very much the advantage, France came out strong in front of a home crowd. An old injury had arisen for Defenceman Cam McGiffin, exacerbated in the fight against Poland. The shoulder was strapped using the RockTape shoulder support technique, as well as a second strip to offload the neck. 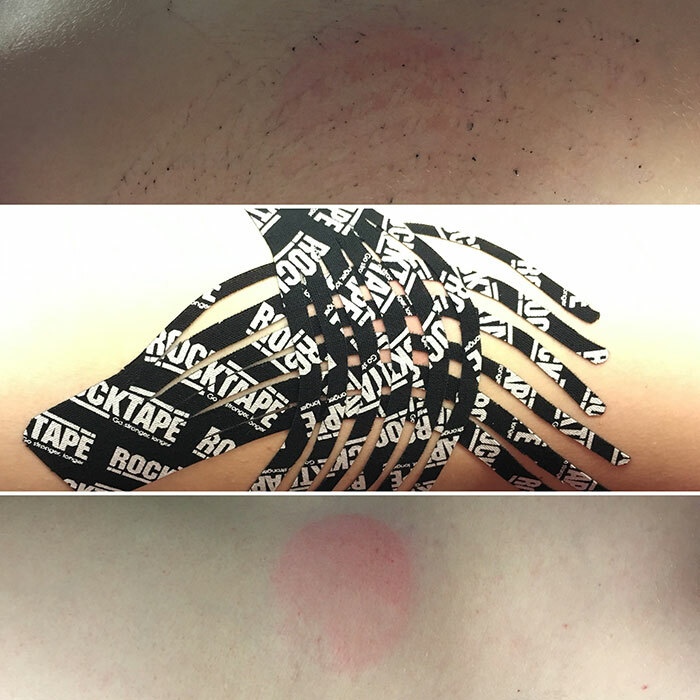 The RockTape enabled Cam to feel his shoulder was well supported, additionally relieving some of the ache into his neck. No longer restricted by rigid tape, McGiffin was able to play 100% to assist fellow team mate Luc Johnson in scoring the opening GB goal which eventually led to Great Britain taking the win. The first lesson I learned when starting work in Ice Hockey was to always watch the puck. 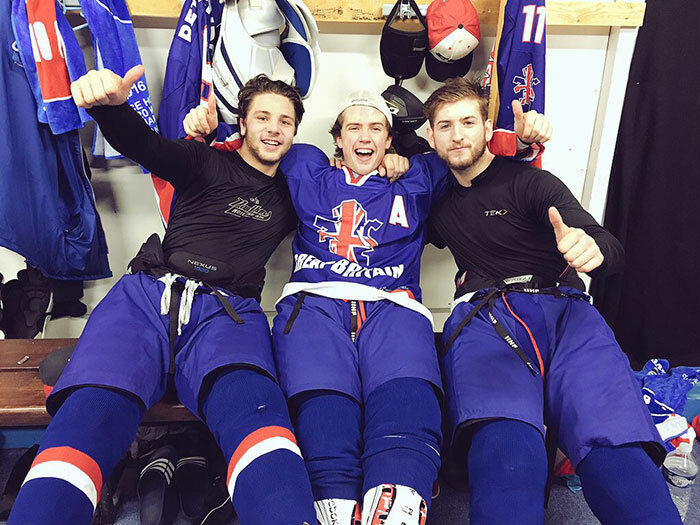 It seems this lesson was cemented for GB forward Michael Stratford while in Megeve. Although excellent with the puck on the ice, Stratford neglected to see it flying towards him while he was on the bench, leaving him with a nice puck-shaped bruise. Once again, the RockTape came out to reduce the impact of this unfortunate injury for the final game. Personally Iâ€™ve found the two most common complaints from Ice Hockey players tend to be lower back pain and hip flexor tightness. It figures that extended periods of forward flexion while on the ice contribute directly to this. I canâ€™t fault the GB players on their commitment to pre and post-game warm up/cool downs, but particularly towards the end of a tournament there tends to be increasing complaints of this nature. 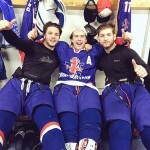 The concluding game for GB was versus Ukraine. A win would secure a medal for the squad but which colour lay in the hands of the other nations. Assistant Captain Lewis Hook, found prior to the match he was struggling with lumbar paraspinal pain. The RockTape lower back technique helped him to play with true â€˜Lions Prideâ€™. By this stage in the tournament we were tackling a number of injuries, aches and pains. However, Great Britain were there to do a job, and that job was to ensure one more win for their country. 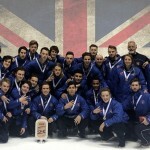 In a nail biting 3-2 finish, Great Britain once more reigned victorious. The sixth seeded team had won a medal in a tournament in which we were very much expected to be relegated. As a Physiotherapist, it is my job to enable every player who goes onto the ice to perform at their very best. It can certainly be a challenge, particularly at high level competition where there is little time to for rest or rehabilitation. However, the character of the sport comes from the players and I think this is where RockTape and Ice Hockey come together well. The players certainly did â€˜Go Stronger, Longerâ€™. Their steely grit and determination secured a bronze medal for Great Britain. 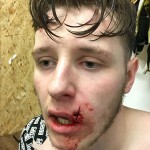 The realisation of this character came for me when Defenceman Jay King took a puck to the face, in front of the oppositionâ€™s net in the final period of the final game. Although bleeding profusely and having a lip you could see his teeth through, King was adamant he could finish the game. 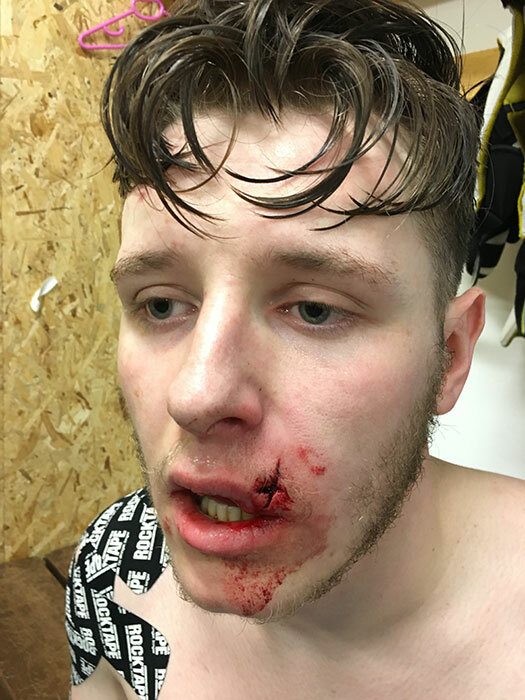 Unfortunately for Jay he was made to go to the hospital and have 9 stitches â€“ an injury this time that we couldnâ€™t fix with RockTape! Jayâ€™s biggest worry however, was that he wouldnâ€™t be able to finish his tube of salt and vinegar crisps. â€˜Dare to dream, prepare to dream, wear the dream, share the dreamâ€™. 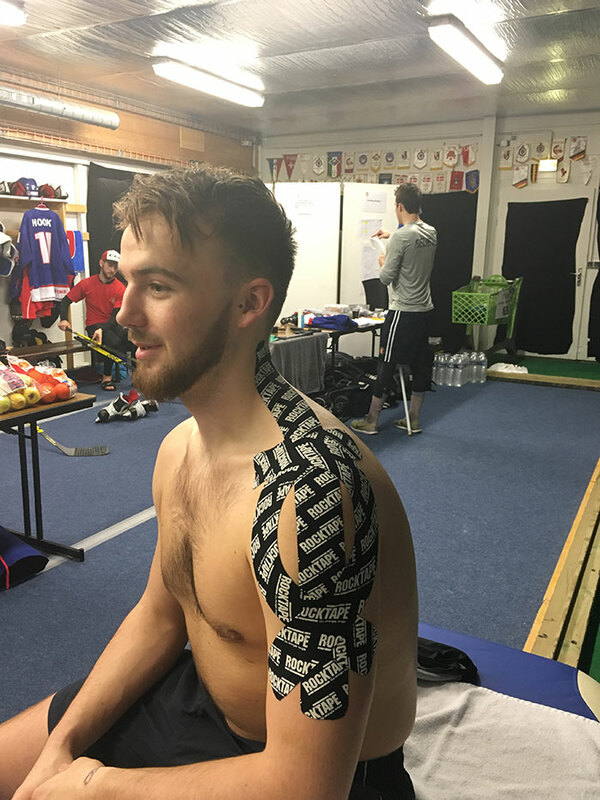 I would like to thank RockTape on behalf of the U20s Great Britain Ice Hockey Team for your support through the World Championships. 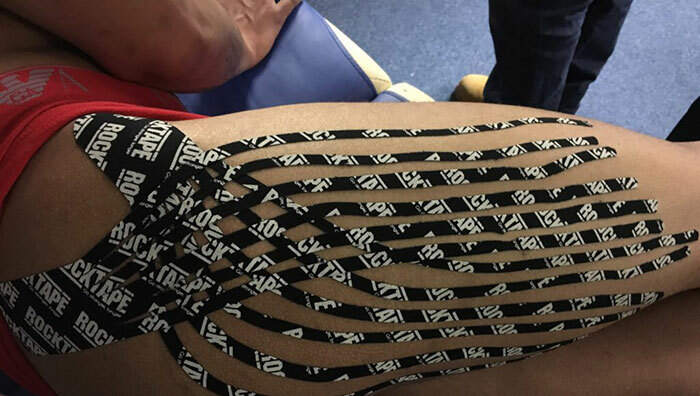 We very much enjoyed using your products and will continue to use RockTape in future. Gabby McGraw BSc (Hons), MCSP, MAACP, HCPC Reg.